Christmas can mean family and friends and anticipation for the years ahead. When there has been a bereavement, Christmas can be a difficult time and somehow, no matter how hard we try, the lights just do not sparkle as brightly. As we rebuild sometimes we find ourselves catching a moment, or a day, or even a week, when things are looking up. But still deep within we silently hold the hurt. Christmas takes on many different meanings. Amid the excitement and festivities there is also a time for remembering. We feel close to our departed in a way that is special and unique. We would like to invite you and your extended family and friends to join us in A Christmas to Remember. Together we will share a commemorative time and celebrate Christmas. You may wish to light a candle to symbolise a life still significant, and there will be an opportunity to write a personal message on an angel card to place on our tree. 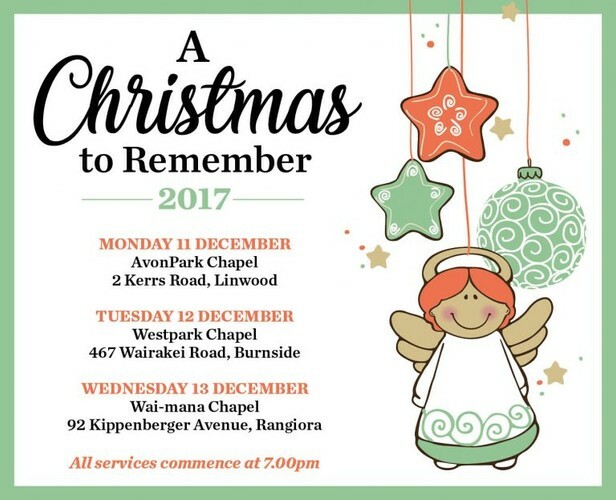 In the New Year the messages will be gathered together and interred at our Living Memorial at Otukaikino to form a tribute in memory of those who no longer share Christmas with us. All services commence at 7pm.